While most snow plows are made for contractors driving heavy-duty trucks, the Nordic Auto Plow works with virtually any car or SUV. As long as your car or SUV is equipped with a solid bumper, the Nordic Auto Plow lets you finally ditch that snow shovel for good. 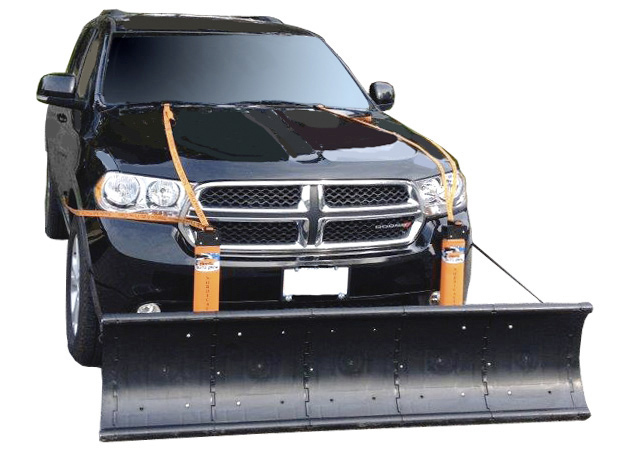 The plow features a universal design with straps and bungees that secure the plow to your hood and body panels. The plow's 79" composite blade will clear your driveway in minutes without gouging your pavement or grass. Best of all, this plow costs less than most snow blowers. Since the Nordic Auto doesn't have any that complicated parts that might wear down or malfunction - like hydraulics or electric motors - it has almost zero maintenance cost. Backed by a 1-Year Limited Warranty. We currently do not have any FAQs for the SnowSport HD Snow Plow. If you have any questions, email us at [email protected]. The Nordic Auto Plow features a 1-Year Limited Warranty. Angela M from Park City, UT, who drives a Universal Any UNIVERSAL. I am disappointed that it didn't come with any rubber on the bottom of the plow; it is just plastic... that will be easily worn down within a single season. I am going to modify it by adding a rubber liner, so it will hopefully last longer. I was also disappointed in the length of some of the screws, again, I went to the Home Depot and got longer ones to help make it stronger. I haven't tested it yet, as we don't have any snow yet. Didn't like blade was 5 pieces. didn't realize that from the picture...other than that, it works. I bought this because I have bad back. I've been shoveling by hand for years and finally got sick of my wife yelling at me to buy a blower. For the cost, this seemed like a better buy than a snowblower.